This is my students’ favorite review game. I’m pretty sure I originally got the idea from Elissa Miller, but I’ve been working on the rules with my classes for the last couple years. I think that last year we developed the definitive version. Teams start with four balloons. Not pictured here are the fun and usually clever names they come up with. A question is projected on the board for each team to answer. I usually give a time limit of around two minutes, but go longer or shorter depending on the question and my goals. After time is up, I call on a random student from each team to come and show me their answer. While the chosen students come to the front of the room, the answer is displayed for the other students. Each team that gets the question correct must take another team’s balloon. I usually limit students to about 20 seconds to decide whose balloon to steal, otherwise they’ll spend all day making their choice. 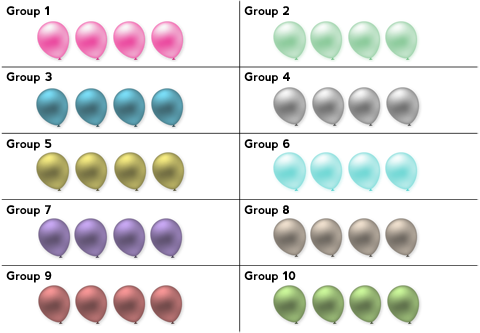 I also randomize the order that groups steal balloons to make it a little more fair and interesting. In the example, Groups 3, 7, and 10 appear to have answered incorrectly. Group 7 appears to have made some enemies. And Group 1 took a balloon from Group 3, while Group 2 took one from Group 5, etc. A student once told me that this game ends friendships. What more could you ask for? Play continues until the period ends or we run out of questions. The winner is the team with the most balloons. I use Extended Desktop and project the PowerPoint to my projector, leaving the actual file open on my computer monitor. This allows me to move the balloons around without restarting the slideshow. 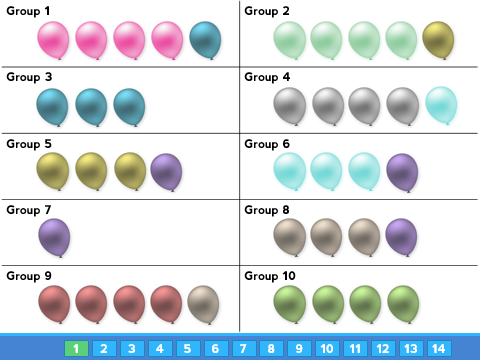 There are four balloons on the sides of the score slide that you can quickly copy and paste into each group’s box. Hold down CTRL and drag while you have something selected to quickly make a copy of it. 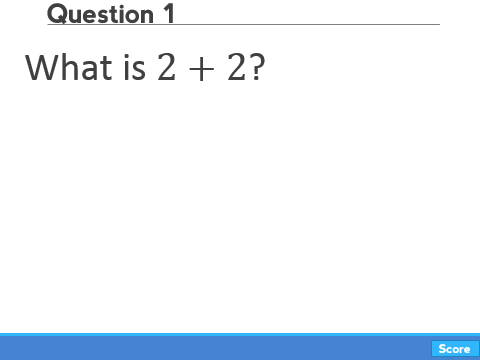 When you’re making your questions and answers, the answer is on a text box to the right of the question. Again, editing at 50% magnification will make it easier to navigate without scrolling so much. Click the “Score” button on a question slide to go back to the score slide. Click the numbered buttons on the bottom of the score slide to go to each question. They turn green after you’ve clicked them once because I got tired of forgetting which question we were on. 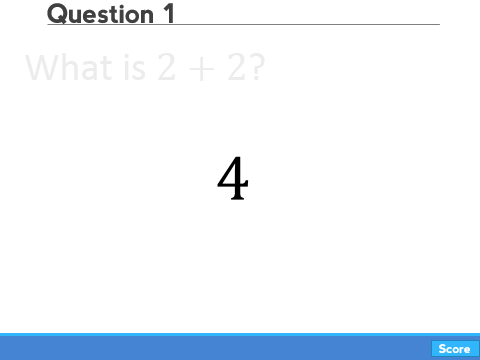 Click anywhere on a question slide to show the answer. 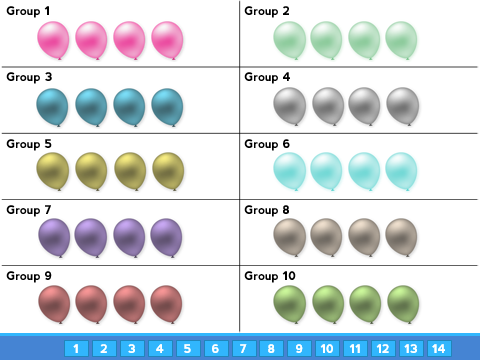 Click here to download my blank balloon pop template (.ppt). 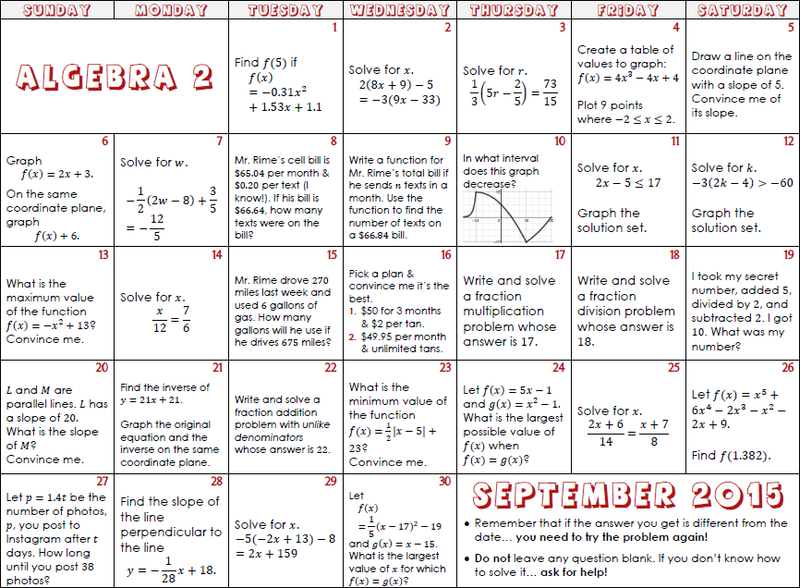 After an inexplicable absence during the last school year, problem calendars are back in 2015–2016. 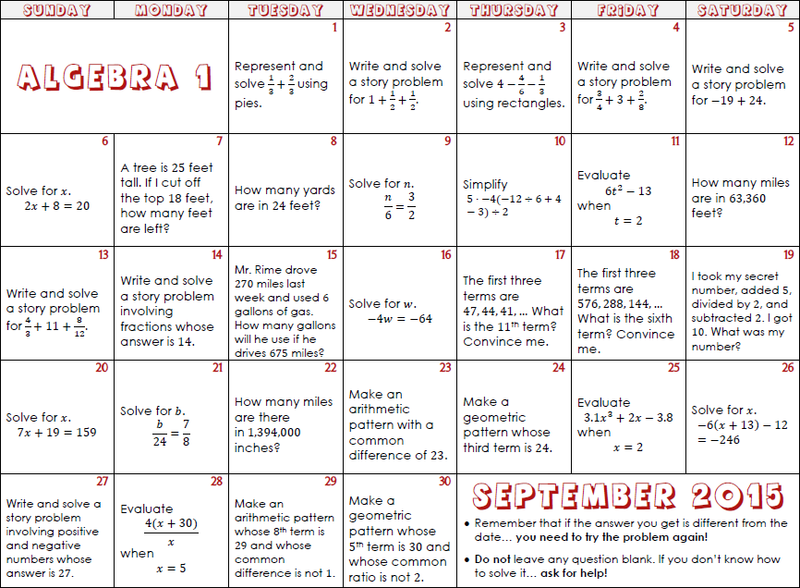 My plan is to fill in the missing months and fix all those pesky errors. As always though, if you find errors… please let me know! I made a few changes in the content of the questions. In particular, on the unit conversion questions I got rid of the information like how many feet are in a mile. 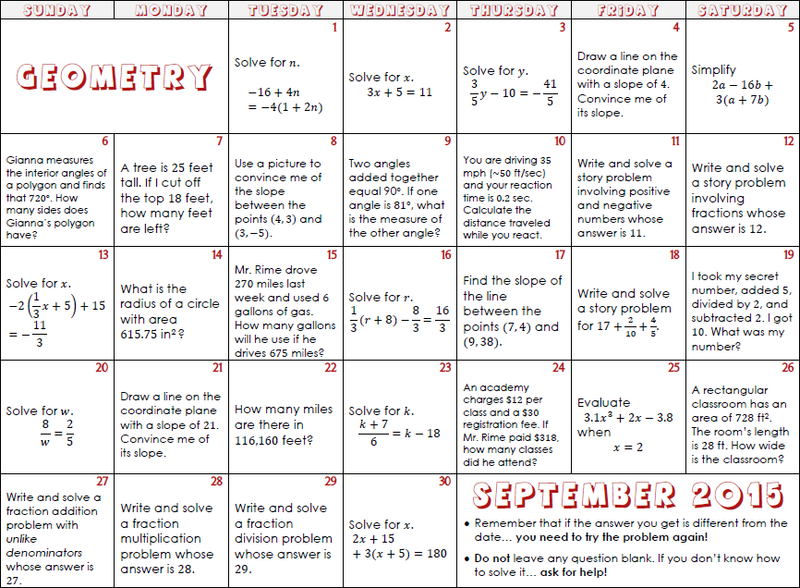 I’d like to help my students be more resourceful this year, and that is one step in that direction. There are no explicit instructions about process being more important than the answer on these, so you’ll need to stress that in class. I remind students that everyone already knows the answer to each of the questions, and that one of the things we’re practicing is explaining our reasoning, thinking, and process. That means, for example, that you have to show all your steps when solving an equation on these, even if you could do it in your head.